Heat the oil over medium heat in a large saucepan. 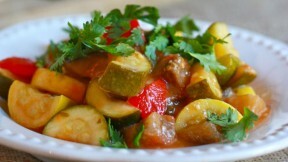 Once hot, add the bell pepper, zucchini and summer squash and sauté for about six-eight minutes until just tender. Add the eggplant and tomatoes and continue cooking for another 15-20 minutes until the mixture is thick and stew-like. Add half of the basil followed by the salt, pepper and red pepper flakes. Stir well, adding more seasoning if you desire. Serve ratatouille with additional fresh basil and crusty bread for dipping.